Chapter 6 extract: As you leave the first green and climb slightly higher to the second tee it just gets better; to the south are the town and its bay, to the east Calve Island and the mainland, to the north Ben, Hiant, Loch Sunart and Ardnamurchan and to the west Mull’s interior and northern coast. Spend some time taking in the landscape because after the testing starter comes the stroke index one Creagan and you will need your wits about you; the course may be well under five thousand yards (for 18 holes) off the yellows but it is no push-over. The first shot takes you back to the gully that you crossed from the first except it is further down the hill with less hazards but then it is a dogleg right up to the second green which is more or less on a level with the plateau from the first; in other words it is a steep climb up to an invisible green. 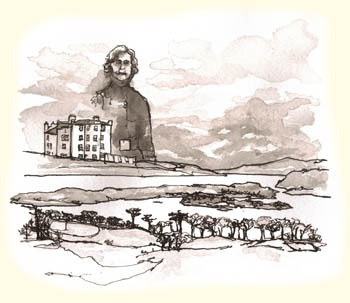 The drawing shows the view towards Calve Island with an impression of Unity Mitford and the house on Inch Kenneth.